The Crossrail project, will use the marooned stub of track between Custom House and North Woolwich, surfacing from its London side tunnel just west of Custom House station and continuing in the North Woolwich direction before diving into tunnel again under the Thames. There will be no replacement station at North Woolwich. The original station building is Grade II listed, so that at least will survive. The elegant station building which remained in use until 1979. It was badly damaged during World War II and its roof was replaced by a flat conrete one, which still remains. 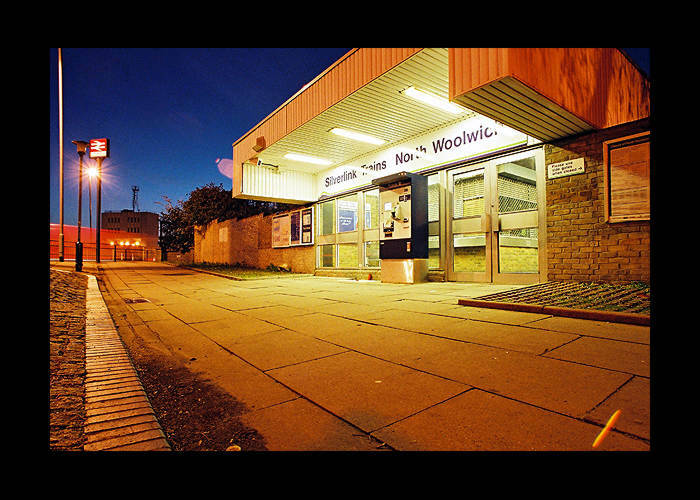 The building was home to the marvellous North Woolwich Old Station Railway Museum until late 2008. Interior of the old station building / museum. The London Rail Heritage Centre had a nice plan to develop the station site and line as far as Custom House for "...heritage operation, but also trains for training and testing purposes" but unfortunately nothing came of it. And the lovely ladies providing the friendly chat on this visit. Photo taken just before closure in 2006 of the replacement booking office, opened in 1979, looking far more attractive in this photo than it actually was. It also seemed to be rarely open, the machine outside providing the normal means of obtaining tickets. Move your cursor over the image to see the same view, albeit in daylight, in 2009, three years after the closure of the branch. The interior of the ticket office.